Herbert Hoover writes the Rules and Regulations governing the manufacturing of crackers. RULE 1. The licensee in manufacturing crackers shall not use the following ingredients in amounts exceeding those specified below per unit of 196 pounds of any flour or meal or any mixture thereof. Shortening: Not to exceed 17 pounds average in sponge goods of which not more than 10 pounds shall not be animal fats. 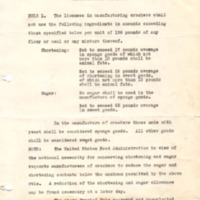 Sugar: No sugar shall be used in the manufacture of sponge goods. Not to exceed 55 pounds average in sweet goods. In the manufacture of crackers those made with yeast shall be considered sponge goods. All other goods shall be considered sweet goods. NOTE:The United States Food Administration in view of the national necessity for conserving shortening and sugar requests manufacturers of crackers to reduce the sugar and shortening contents below the maximum permitted by the above rule. A reduction of the shortening and sugar allowance may be found necessary at a later day. The above Special Rule approved and promulgated this 27th day of November, 1917, to be effective December 10, 1917. Hoover, Herbert, 1874-1964, “Special Rules and Regulations Governing Licensees Manufacturing Crackers,” 1917 November 27, WWP19276, Hoover Institute at Stanford University Collection, Woodrow Wilson Presidential Library & Museum, Staunton, Virginia.